BF is a counter current reactor in which the reducing gas is produced by the gasification of the carbon of the BF coke with the oxygen of the hot blast injected via tuyeres in the lower part of the furnace. The reducing gas flows upwards reducing the iron bearing burden materials charged at the top of the furnace. Coke rate is the parameter for the consumption of BF coke which is measured in kilograms of BF coke consumed per ton of hot metal produced. Blast furnace (BF) coke is a key material for BF ironmaking, acting as a major energy source (fuel), a reductant, a carburization agent and a permeable structural support. There is no other satisfactory material available, which can replace, fully or partially, BF coke as a permeable support of blast furnace charge. BF coke is the most important raw material fed into the blast furnace in terms of its effect on blast furnace operation and hot metal quality. A high quality BF coke is able to support a smooth descent of the blast furnace burden with as little degradation as possible while providing the lowest amount of impurities, highest thermal energy, highest metal reduction, and optimum permeability for the flow of gaseous and molten products. Introduction of high quality BF coke to a blast furnace results in lower coke rate, higher productivity and lower hot metal cost. Role of coke in improving the BF performance is shown at Fig 1. A realistic assessment of the likely performance of coke in the blast furnace operating with or without injection technology includes those properties of coke that reflect its resistance to degradation under the chemical and thermal environment of the blast furnace. Such properties, providing guidelines for coke use, relate to lump size, shape and size uniformity, chemical composition, mechanical strength, and thermal and chemical stabilities. Thus, coke for the blast furnace needs to be a successful compromise between structure and properties. To ensure good blast furnace performance, coke should be moderately large, with a narrow size range, and have a high mechanical strength in order to withstand the weakening reactions with carbon dioxide and alkali, abrasion, and thermal shock in the blast furnace. Because of the many unknown factors, it is not achievable to establish universal quality indices common to all blast furnaces, although typical specifications for BF coke quality are available. Impurities present in BF coke affect its performance in the blast furnace by decreasing its role as a fuel in terms of amounts of carbon available for direct and indirect reduction roles and also its role as a permeable support. Such impurities are moisture, volatile matter, ash, sulphur, phosphorous, and alkali contents. Their levels are to be kept as low as possible. Moisture content is a direct consequence of the coke quenching process with some dependence on size. High and variable moisture contents affect both the coke rate and the balances within the blast furnace, while high volatile matter contents cause operational problems in the cleaning of blast furnace gas. As regards other chemical properties, sulphur and ash (content and chemistry) are of particular importance because as they increase, coke productivity in the blast furnace decreases. The coke ash is a non productive part of BF coke which influences slag volume and composition. The importance of BF coke’s physical properties is linked to the need to support the ferrous burden and to give a permeable matrix through which reducing gases can flow and molten material can percolate in the lower blast furnace region. These physical properties are related to its size (mean and distribution) and its resistance to breakage and abrasion. BF coke size is mostly controlled by screening. A large mean size with a narrow size distribution maintains adequate permeability. Although BF coke’s mechanical strength indices provide BF operators with a useful assessment of BF coke performance, they form only part of the overall picture. The tests used to assess BF coke mechanical strength are made at ambient temperature and hence fail to take into account the process conditions of the coke in the blast furnace. Hence tests like CSR (coke strength after reaction) and CRI (coke reactivity index) for BF coke provide better strength indices. BF coke degrades during its descent through the BF. Degradation is caused by mechanical load, attrition, thermal stress, gasification reactions, inorganic compounds present in BF gases, and graphitization. Mineral matter in BF coke plays a major role in the character and extent of these degradation pathways, both directly and indirectly. 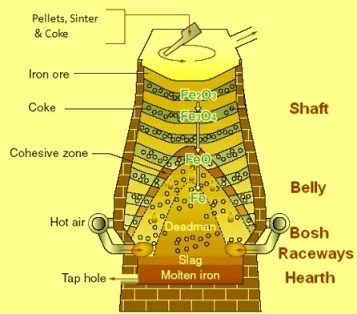 The process of iron making in a blast furnace consists of a multivariate system which is subjected to a large number of inter-influencing variables affecting the BF coke consumption in the blast furnace. It is necessary to isolate the inter-influence of the variables to understand the role played by the each variable on the coke rate during iron making in the blast furnace. An efficient blast furnace operates at a low coke rate. An efficient blast furnace operation requires an increase in the gas throughput, which implies improvement in the furnace permeability and on the other hand a reduction in the specific gas requirement, which means a reduction in the specific consumption of BF coke. There are many factors which influence the BF coke rate in a blast furnace. Major amongst them are described below. Fuel/reducing agent – Two types of fuels/reducing agents are used in the blast furnace. These are BF coke which is charged from the top and pulverized coal/ natural gas/ coke oven gas/oil/coal tar which are injected at the tuyere level. During the production of hot metal in a blast furnace, BF coke rate is influenced in many ways. High ash content in BF coke means charging the blast furnace with more slag forming material which is to be fluxed to form slag. This results into higher slag volumes. As per thumb rule 1 % reduction in the ash content of the BF coke results into decrease in coke rate by 1 % to 1.5 %. Other properties of the BF coke which affects the coke rate are CSR, CRI, and micum indexes (M40 or I 40 and M10 or I 10). These parameters affect the permeability in the stack and the mechanical strength of the coke at the tuyere level. M40 represents crushability of the coke and M10 wearability. Higher values of CSR and M40 and lower values of CRI and M10 result in improvement in the lower coke rate. Sulphur content of the BF coke has also got its affect on the BF coke rate. A decrease of sulphur content of BF coke by 0.1 % improves the BF productivity by around 1.0 %. Fuel (pulverized coal/ natural gas/ coke oven gas/oil/coal tar) injected at the tuyere level is normally accompanied by oxygen enrichment of the hot air blast. The injection of oxygen to the air blast reduces the specific flow of the gas causing a reduction in the top temperature and an increase in the adiabatic temperature (RAFT) in the tuyeres. These effects are compensated by the injection of substitute fuel. Thus a combined injection of oxygen and fuel at the tuyere level decreases the coke rate in a blast furnace. One ton of pulverized coal injection replaces around 0.9 to 1.0 ton of BF coke. Similar reduction in the BF coke rate takes place with other fuel injections. Oxygen injection alone does not reduce BF coke rate but improves BF productivity. Raw materials – There are basically two types of major raw materials which are charged in a blast furnace. The first one is iron bearing materials which are sinter, pellets and calibrated iron ore (CLO). Higher iron (Fe) content in these materials means lower gangue material is going inside the furnace which needs to be fluxed for slag formation. Hence higher Fe content helps in the reduction of slag volume and coke rate. As per thumb rule 1 % increase in the Fe content reduces coke rate by 0.8 %n to 1.2 %. The second raw material is the different type of fluxes (lime stone, dolomite and quartzite etc.). Lime stone and dolomite when charged in the blast furnace gets calcined inside the blast furnace. This calcination reaction needs heat which result into increase in the coke consumption. If these fluxes are charged through sinter or pellets then the calcination reaction takes place outside the blast furnace and the blast furnace working volume is more effectively used by the iron bearing materials. This in turn reduces the blast furnace coke rate. Generally reduction of 100 kg of flux in the burden improves the coke rate by 20 to 35 kg/tHM. For achieving lower coke rate in a blast furnace it is essential that burden materials provide high permeability and homogeneity across all furnace temperature and reaction zones. Further the burden materials are to have high reducibility to promote short retention time. Burden materials are also to have low content of tramp elements such as zinc, lead and alkalis to avoid process disturbances. Coke rate also depends on the quality of sinter. Sinter is to have optimum grain distribution, high strength, high reducibility, high porosity, softening temperatures greater than 1250 deg C, constant FeO content in the range of 7 % to 8 % and constant basicity. Control of burden distribution plays an important role in the reduction of the coke rate in a blast furnace. The burden distribution control ensures a stable burden descent, adjusts the flow of gases in the wall (this avoids high heat loads without generating inactive zone) and helps in achieving a good solid gas contact. Decreasing the silicon content in the hot metal has a positive effect on the coke rate. Decrease in the silicon content is achieved due to better ore-coke relation and movement of cohesive area downwards. This generates a lower volume for the transfer of silicon to the hot metal. Decrease of silicon content in the hot metal by 1 % improves the coke rate by 5 % to 15 %. Properties of slag have considerable effect on the coke rate. Lower specific volume of slag of lower viscosity improves the coke rate of the blast furnace. Tapping practice also has an important role to play in the reduction of coke rate in a blast furnace. Good tapping practice involves good taphole length, timely opening of the tapping, control of tapping speed, proper hearth drainage, and closing of tapping after furnace becomes dry. Quality of tap hole mass is very important for good tapping practice. Automatic process control improves the furnace productivity since it minimize consumption of reductant, avoids furnace process disturbances such as hanging, slipping, scaffolding, gas channeling etc through an immediate counteraction by the system, stablizes hot metal and slag parameters etc. The effect of automatic process control on the blast furnace coke rate is in the range of 3 % to 5 %. Blast temperature is other parameter which influences the coke rate in a blast furnace. Blast furnace coke rate reduces by around 2 % with the blast temperature increasing by 100 deg C.
High top pressure also reduces the coke rate in the blast furnace. With every increase of top pressure of the blast furnace by 0.1 kg/sq cm there is a reduction of around 0.1 % in the coke rate. Decreasing of fines content in the charge materials improves the coke rate of the blast furnace in the range of 0.4 % to 0.7 %.